Brother Printers with Cash Back on selected models? 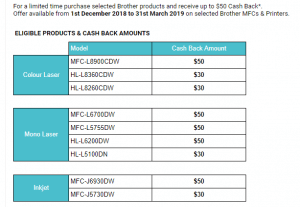 For instance, If your in the market for a colour or mono laser or inkjet printer now is the time to grab a bargain with up to $50.00 cash back on selected models till 31st of March 2019. For a complete overview of models and Cash Back you can visit www.brother.com.au. Brother printers are renowned for reliability and quality. Brother also offers for added peace of mind lifetime product support by phone or email eastern standard time Monday to Friday. Now that’s service! For all your Brother printer and consumable needs please call the friendly professional team at Inkwell Cartridges & Toner. Remember spend $50.00 or more and get free delivery Australia wide.